Tárraga López, P.J., et al. Effect of Three Methods of Approaching Obesity in Long-Term Weight Loss. (2017) J Diab Obes 4(2): 1- 8. © 2017 Tárraga López, P.J. This is an Open access article distributed under the terms of Creative Commons Attribution 4.0 International License. Objective: To analyze the effect on weight reduction in overweight and obese patients through three intervention methods. Material and methods: Prospective, randomized, multicentric intervention study in overweight and obese patients with a 12-month follow-up. Patients were randomized into three intervention groups: Obesity motivational intervention with previously trained nurse (G1), lower intensity consultation, no motivational group, digital platform support (G2), and a third group that received a recommendation to lose Weight and follow-up in primary care consultation (G3). Weight, height, BMI, abdominal waist circumference, Lipid Parameters, Blood Pressure and Blood Glucose were collected. Results: The study enrolled 176 patients, of whom 60 were randomized to Group 1, 61 to Group 2 and 55 to Group 3. 58% of the populations were women and 42% men, being therefore the global ratio between men and women from 1 to 2.65. In all three groups the weight decreased in each visit, with an overall mean reduction at the end of the study of 3.9 kg. It can be seen how the three groups reduce total cholesterol, although the G1 with motivational intervention reduces it significantly more with respect to G2 and G3. On the other hand Triglycerides are significantly reduced by the two study groups. And HDL-C is increased in all three groups. Conclusions: The three groups managed to reduce weight, although the group with motivational intervention and telemedicine showed significant differences. The important global increase in obesity is one of the challenges more difficult in public health that must face the present society[1,2]. According to the World Health Organization (WHO), 1980 and 2014, the global prevalence of obesity (mass index Body [BMI 30)) has doubled. In the world being overweight and obesity are associated with more deaths than low weight. Spain, corroborating this trend, is reaching obesity figures that indicate that we are facing a serious public health problem given the associated comorbidities that excess body weight involves[5,6], besides demonstrating its independent relationship with mortality. According recent date 60.9 % of the adult population, between 25 and 64 years and 41.3 % of children were overweight or obesity. High BMI and abdominal obesity (AO) have well-known associations with all-cause mortality[4,9,10], morbidity[11,12] and disability, resulting in unhealthy life-years with poor quality of life[13,14] and increased health care costs[15,16] In fact, obesity is a risk factor for diseases Such as diabetes mellitus (DM) type 2 diseases cardiovascular and some types of cancer. Following the report drawn up from data from 2013 by the Institute for Health Metrics and Evaluation on the Disease attributable to the major 15 risk factors, expressed as a percentage of years of life adjusted by disability, the risks associated with a high BMI and a of inadequate diet occupy the first 2 places in the analysis carried out for Spain[18,19]. Some authors point out that the prevalence of Obesity is now stabilizing. However, Disparities in date from the adult population in different European countries and rising trends continue to be reported among adults in some studies[20,21]. The high prevalence of weight overload makes it necessary to continued vigilance in order to improve strategies against Obesity in Spain. In 2013 WHO adopted the Action Plan World Health Organization for the Prevention and Control of Transmissible 2013-2020, and aimed at zero increase of the prevalence of obesity between 2010 and 2025. While it’s evident that treatments based on the Mediterranean diet in side by side with cognitive behavioural intervention and physical exercise are effective in treatment of obesity and its associated diseases[23-28], Spanish society is gradually moving away from the traditional Mediterranean diet[29-31]. Thus, in 2011, consumption of fruits, vegetables, oils, legumes and fish, Mediterranean tradition food, has fallen in relation to the previous years, while consumption of pre-prepared meals has increased considerably, which may explain the increase in obesity observed in our population. There are diverse experiences of weight loss treatments based on the Mediterranean diet, since 1993 treatment of weight loss based on Mediterranean diet is being implemented, exercise and conductive therapy has been proven to be effective in treating obesity and its associated diseases[33-35]. Similarly, in the SUN study on adherence to the Mediterranean diet and weight change on the long term that included more than 10,000 subjects during two years of follow-up, it was observed that the group with the highest adherence to the Mediterranean diet showed a lower risk of weight gain. Interventions that focus on changing eating habits and increasing daily physical activity in order to promote a healthy lifestyle are the best options to address overweight and obesity. In addition, other components of cognitive-conductive therapy from the behavioral perspective have shown to be relevant to be included in interventions targeting at overweight and obesity in order to improve their effectiveness and promote the maintenance of the obtained results. Moreover regarding the effectiveness of these interventions to reduce weight, evidence has found satisfactory results, achieving reductions between 5% and 10% of the initial weight[37-39]. But when considering the maintenance of the weight loss over time, the results are less encouraging. Scientific evidence indicates weight regain between 30% and 35% in patients during the first year after concluding the intervention. 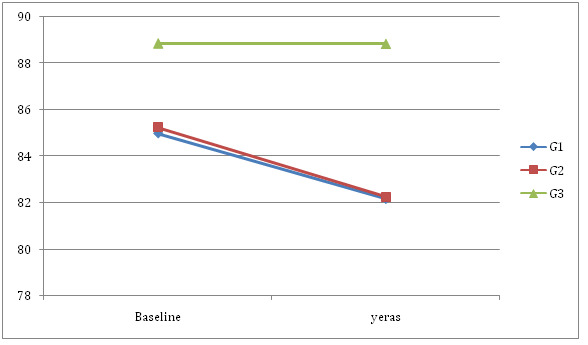 Weight regain is over 50% regarding the first phase evaluation in a 5 years follow-up. Our group designed a group motivational intervention, provided by nursing previously trained by expert psychologists, added to usual care in obese patients followed for two years, and later published the results with 36% of patients achieving weight loss ≥ 5%. This intervention was then replicated in another geographical area of our country, repeating the results 16. As was previously published in routine care, a one-hour group motivation intervention was added every 2 weeks from weeks 1 to 12 following the LEARN (Lifestyle, Exercise, Attitudes, relationships and Nutrition) program 17 and Monthly from weeks 13 to 32, following the instructions of the Weight Maintenance Survival Guide18 program. With this protocol the losses were in the first study and in the second. Although the results were highly satisfactory, the protocol added a cost of 32 more hours for every 10 patients, ie 3.2 hours per patient per year. In fact, all of the interventions that have proven useful need to be intensive, well-structured and address multiple aspects. This entails a significant investment in time and human resources in our health system. That is why we need to find strategies that allow us to use effective approaches on the short run as well as the medium and the long ones that consume fewer resources so as to allow us to intervene on a larger population. Moreover the Information and Communications Technology (ICT), especially the Internet, is emerging as a new strategy with different potentials, able to cope with the limitations of the traditional programs, in order not only to achieve weight loss but also to maintain the results after concluding the intervention. Technology- based health services, delivered or enhanced through the Internet (ie, eHealth technologies) and, in particular, mobile technologies, offer great potential to increase the reach of public health initiatives and to improve public health[44,45]. This potential is enhanced by increasing adoption rates for mobile and Internet technologies. In 2014, there were 6.5 billion mobile subscribers (93% of the entire world population) 25, with mobile phone penetration rates reaching over 70% of the population of many European and North American countries, such as Spain (83%)26, Canada (78%), the United Kingdom (75%), the United States (73%), and Italy (71%). ICT being available for a large part of the population, allow people to access them from home or other places, and to receive treatment with an intervention adjustable to their personal needs reducing the costs associated with the traditional protocols. An increasing number of systematic reviews and meta-analyses on weight management eHealth interventions are available. However, most focus on mobile technologies alone and do not provide a comprehensive picture of the research involving both Web 2.0 and mobile phone technologies for weight management in particular. In fact although numerous wearable technologies specific to physical activity and diet are available, but it is unclear if these are effective at improving weight loss. In that way, studies are needed in our environment to confirm the effectiveness and feasibility of such interventions in overweight and obese patients, and to figure out if it’s worthy to implement their application in the Primary Care as a tool in addressing this health problem. Therefore, the main objective was compared with a standard behavioral weight loss intervention (standard intervention), a technology-enhanced weight loss intervention and a more distant follow-up would result in greater weight loss and to assess if weight loss persists more of 5% after one year of follow-up. Randomized, controlled, double-blind, parallel clinical trial with 3 arms and 12-month follow-up. This study was approved by the Ethics Committee of Igualada (Barcelona) ID543 / 2013. For this trial conducted from March 2015 to Juny 2016, all overweight or obese men and women aged 30 to 70 years diagnosed for physician health laboral services. With no evidence of participation in diet reduction programs within the last 12 months and completed a personal health and medical history questionnaire which served as a screening tool. Exclusion criteria were type 2 diabetes mellitus or impaired glucose tolerance (plasma glucose levels of 140 -200 mg/dL 7.8 - 11.1 mmol/L 2 hours after a 75 –g oral glucose load), hypertension (blood pressure 140/90 mm Hg) or if the participant was taking antihypertensive medication, cardiovascular disease, psychiatric problems, history of alcohol abuse (intake of 500 g/wk in the last year), current smoking, and any medication. No patient was pregnant or became pregnant during the study. This study was approved by the Ethics Committee of Igualada (Barcelona) ID543 / 2013 and all study participants gave written informed consent. Participants were individually assigned to either the intervention or the control group by a number generated informatically. Neither nurses nor physician who visited participants did not have access to the randomization list. Patients were randomized into three intervention groups: (G1) Motivational intervention of obesity with previously trained nurse (IMOAP) (G2) intervention in Primary Care with the support of a digital platform and another group receiving guidelines to lose weight and follow-up in Primary Care Centers (G3). Medtep platform offered to participants in the intervention group (G2) access to the Mediterranean Diet Adherence Screener (MEDAS) and keep ongoing about level of adherence. Adherence to the Mediterranean diet was assessed using the validated 14-point MEDAS, adaptation of a previously validated 9-item index. The MEDAS was developed within the PREDIMED study group. The MEDAS can rapidly estimate Mediterranean diet adherence and may be useful in the clinic. The 14-item screener includes 12 questions about food consumption frequency and two questions about food intake habits characteristic of the Spanish Mediterranean diet (Table 1). 13 Preferring White meat over red meat? 14 ≥ 2 servings/week of a dish with a traditional sauce of tomatoes, garlic, onion, or leeks sautéed in olive oil. a.If the condition was not met,0 points were recorded for the category and if the condition was met, 1 point was recorded for the category. Values are expressed as number. Participants knew their initial level of adherence previously to intervention. After that health professional asked them to answer the test every day (self monitoring food diary) and the platform gave to the participant the level of adherence weekly. In that way this tool was useful in evaluating the compliance with Mediterranean diet allowing personalized dietary advice given automatically by platform. At the same time the platform proposed to the participant getting better results in the aspects without good compliance. Some recipes were sent to them. The protocol applied in G1-2 after the first visit: visits were scheduled at 15 days, one month, 3 months, 6 months and 12 months. In each of the visits anthropometric data were collected, physical activity level was reviewed, adherence to the Mediterranean diet using the data recorded by the patient in the Medtep digital platform was reviewed and the patient was encouraged to improve adherence level to the Mediterranean diet. The G3 received guidelines and recommendations to lose weight. Participants in the G3 were given general oral and written information about healthy food choices based on Mediterranean diet, and exercise at baseline and subsequent visits (Table II). Table II: Distribution of the sample by gender. G1: Consultation group; G2: Consultation + Telemedicine Group; G3: Group that is recommended to lose weight. The data are displayed as exact quantity and (percentage). The comparison between the proportions was performed with the X2 test (p = 0.931). Those recommendations included information on three different concepts offering the patient self-monitoring instruments. First concept “The weight monitoring can be useful in terms of achieving the goal of weight loss” To achieve this objective the patient was offered the opportunity to record his weight in primary care centers periodically with the same frequency as in the G1 group. Second concept: “Following a Mediterranean dietary pattern promotes the acquisition and maintenance of a proper body weight”. Third concept: “Following a Mediterranean dietary pattern involves adherence to dietary guidelines and maintaining an active lifestyle”. Weight in kilograms (kg) wearing very light clothes was measured using a digital scale (range from 0.1 to 150 kg and precision of 0.1 kg), height in meters (m) with the subject barefoot using Harpenden digital stadiometer (range from 0.7 To 2.05 m and precision of 1 mm) and BMI was calculated (kg/m²). Waist-circumference was measured in the horizontal plane midway between lowest rib and the iliac crest. 0.1 cm at the end of a normal expiration. Assays for serum total and high-density lipoprotein cholesterol, triglyceride, and glucose levels were performed in the chemistry laboratory. To assess the power of this study “a posteriori” was assumed with 95% confidence, a ratio of 30% to achieve the goal in the control group and 70% in the experimental group. The total number of participants was 176. The power to contrast an RR different from 1 was 99.69%. All calculations were performed using the SPSS v19.0 statistics program. Quantitative variables are presented as mean and standard deviation (SD), qualitative ones as exact amount and percentage. To verify that randomization was successful among the two compared groups was used in the comparison of means Student’s test for independent groups and the Chi-square test (Pearson or Fisher) in the qualitative variables. The comparison of means during follow-up has been performed by analyzing the variance of repeated measures. When the normality and sphericity criteria were not met, the Friedman nonparametric test was applied. A comparison between the groups after concluding the interventions was performed with indicators of clinical relevance, i.e. ; Relative risk (RR), absolute risk reduction (ARR), relative risk reduction (RRR) and number needed to treat (NNT). The results between both groups are exposed both by intention-to-treat analysis and by biological efficacy analysis. Significant values were considered those whose comparisons have reached a value of p ≤ 0.05. One hundred and seventy six (176) participants were randomly assigned to the intervention G1 (n = 61), n = 60 al G2 with IMOAP and to control group G3 (n = 59). During follow-up, four individuals from the G3 group left the study for personal reasons, leaving 55 individuals in this group (Tabla II). 58% of the population was women and 42% men, being therefore the overall ratio between men and women from 1 to 2.65. The percentage by gender within the three groups was similar (p = 0.931). 20.92% of the patients were overweight while 79.08% were obese. No significant differences were detected between the 3 treatment groups after randomization. In all three groups the weight decreased in each visit, with an overall mean reduction at the end of the study of 4.249 kg. The mean percentage weight reduction was 7.65% for group G1, 5.1% for G2 and 2.1%% for G3 (p-value = 0.009). Table III One interesting fact was to observe how many patients had managed to reduce their initial weight by 5% at 6 months of follow-up and at one year. Table III: Baseline data of the sample by groups. G1: Consultation group; G2: Consultation + Telemedicine Group; G3: Group that is recommended to lose weight; Kg: kilograms; BMI: Body mass index; Cm: centimeters; Kg / m²: kg divided by height in meters squared; Mg / dL: milligrams per decimeter. The comparison between the means was performed with the ANOVA test. 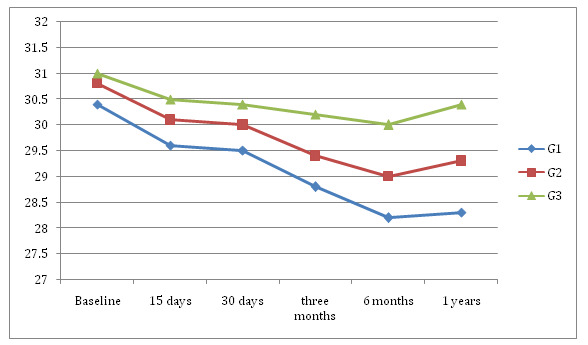 At 6 months, 102 individuals (60.7%) had achieved this weight loss and 84 individuals (50%), maintained this loss a year. When it was distributed through the randomized groups, it was observed that the greatest 5% weight loss at both 6 months and 1 year occurred in the IMOAP group, followed by the telemedicine support group and to a much lesser extent the control group. These data can be better seen in Graph 1. Graph 1. 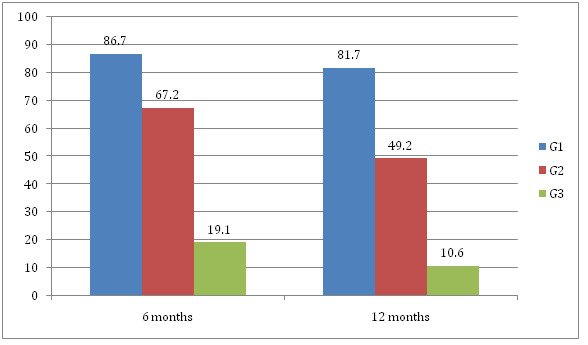 Percentage of patients who achieved a reduction of at least 5% in each of the intervention groups at 6 and 12 months of follow-up. G1: Consultation group; G2: Consultation + Telemedicine Group; G3: Group that is recommended to lose weight. Significant differences were observed between the 3 groups, both at 6 months and at one year (X2 test (p < 0.001 in both cases). 51.8% of the patients reduced 5% or more of the weight: In the G3 control group, 14.9%, 83.3% in the G1 group and 49.2% in the G2 group (p < 0.001). Table IV shows the analysis of clinical relevance after the year of follow-up in those patients who managed to decrease 5% of weight. It can be observed that the consultation group is 8 times more effective than the control group to maintain a decrease of at least 5% of the weight per year of follow-up and 1.5 times more than the consultation + Telemedicine in the same period. Table IV: Qualitative analysis of those patients who achieved the goal of achieving weight loss of 5% per year of follow-up. RR: Relative risk; CI: Confidence interval; RRR: relative risk reduction; RAR: Absolute risk reduction; NNT: Number of patients to be treated. TM: Telemedicine. On the other hand NNT are very low, requiring at least 3 patients (2 in the type of consultation) to achieve a maintenance of the weight decreased more than 5% during a year. The Body Mass Index (BMI) also decreased in the three groups by 1.422, being 2.03 for G1, 1.474 for G2 and 0.613 for G3. (Graph 2). Graph 2. Evolution of weight in the three groups. At 12 months: G3 with G1 difference means 2.0883 p = 0.007 and G3 with G2 difference means 1.0863 (p = 0.320). Regarding the abdominal perimeter, a significant overall reduction of 2.2 cm (p < 0.0001) was observed. According to Graph 3, it appears that the abdominal perimeter continues to fall in the study groups (G1 and G2) with respect to the control group (G3), which appears to increase again after the 6th month. Graph 3: Evolution of the abdominal perimeter. At the beginning of the study there were no significant differences between the groups (p = 0.077 and p = 0.107); however, in the year both G1 and G2 were significantly different from G3, but not in fact the mean of both groups Almost the same. Table V: Evolution of lipids parameters. Table VI: Evolution of lipids parameters for groups. No significant differences were detected in Total Cholesterol and Triglycerides between the groups both initially and at the end but with the HDL-C (p = 0.002 and p = 0.001). Regarding the glycemic parameters, three groups reduced basal glycemia (-4.54 mg / dl) and the decreases were statistically significant with weight reduction (p > 0.001). They also reduced glycated hemoglobin (0.62). In this study we tested the hypothesis that a motivational intervention reduces weight in obese or overweight people more effectively than those followed by consultation and telemedicine or consult only at 6 months as well as at the year of follow-up. However, this method consumes more human and material resources than the other two methods, being telemedicine with consultation significantly more effective than patients followed in consultation. The effect of the motivational group intervention 81.7% is higher than in this case has the use of the digital platform 49.2%, now that it involves a dedication in the nursing consultation properly trained, of 3.2 hours per Patient and year which entails additional costs. Comparing the two groups, it can be seen that the average decrease in body weight at six months changed from 86.7% in G1 to 67.2% in G2, which is accompanied by a decrease in the waist circumference of 2,823 cm In G1 and 2.97 cm in G2 (p < 0.002). In the third group G3 the weight loss is lower, being 19.1% at 6 months and 10.6% per year, accompanied by a reduction of Pc of 0.21 cm at 12 months. Comparing the three groups, significant differences were observed (p < 0.0001). From the data analysis it is clear that the NNT in the first group is 2, ie we should treat two patients to achieve effectiveness in one of them, while the NNT in the second group is 3 and in the third 7- 9 patients. Patients in the G3 Group, after diagnosis of underweight or obesity, were advised to lose it. Although this recommendation should be given to all overweight patients[43,44] different studies have shown that this is not the case. In most of them, the proportion is between 20 and 36% although in the Phelan et al study a proportion of 75.5% was reached. This lack of systematic recommendation happens despite the fact that patients receiving this advice from their family physicians are twice as likely to achieve weight loss as those who did not receive it[25,26]. There is no clear consensus 27 on the barriers that explain this phenomenon, although perhaps the most invoked have been reasons for economic management, lack of motivation on the part of the patient and the lack of time and training of the professionals themselves[26,27]. It is important to emphasize that the use of resources in this third intervention was minimal since only the patient was advised to lose weight, informing him that regular weight registration could be done at the health center, and that patients reach and maintain Better an optimum weight, the more they exhibit greater adherence to DM, and whose lifestyle includes maintaining a good degree of physical activity. Well, if the tendency of adult patients to progressively increase their body weight in this group, not only was this trend reversed, since 24% of the patients stabilized their weight and 19% reduced it. Twenty-one percent of patients achieved a 5% or higher reduction targeting efficacy. This study does not allow us to know what weight had the control factor of weight registration by health professionals and which had the use of the digital tool. Although the analysis shows that patients starting from a level of adherence at the beginning of 8.3, improved with their use so that at the end of the study was 9.9. Numerous studies have shown that simple weight monitoring can facilitate weight loss and / or maintenance after loss on the one hand; On the other hand we know that a greater adherence to the DM is followed by an optimization of the same. In the SUN9 study on adherence to the Mediterranean diet and long-term weight change, it was observed that the group with greater adherence to the Mediterranean diet showed a lower risk of weight gain. Thus the results of this third intervention group lead us to suggest that we use new technologies to measure adherence to DM and then use them to improve adherence levels. Further research will be needed to measure different programs for this purpose, programs that include different monitoring processes, intelligent, adhere to the profile of the user and can include gamification. In conclusion, although the intervention of motivational intervention yields better results both in weight reduction and maintenance, the results of the two protocols presented have a sufficient clinical impact much more considering the scarcity of resources that they use. So we believe that it is fundamental to continue to explore the role that new technologies can have in the treatment of overweight and obesity. 1. Popkin, B.M., Adair, L.S., Ng., S.W. NOW AND THEN: The Global Nutrition Transition: The Pandemic of Obesity in Developing Countries. (2012) Nutr Rev 70(1): 3–21. 2. Flegal, K.M., Kruszon-Moran, D., Carroll, M.D., et al. Trends in Obesity Among Adults in the United States, 2005 to 2014. (2016) JAMA 315 (21): 2284-2291. 3. Global Health Observatory (GHO) data: Obesity. (2015) World Health Organization. 4. Di Angelantonio, E., Bhupathiraju , S.N., Wormser, D., et al. Body-mass index and all-cause mortality: individual- participant-data meta-analysis of 239 prospective studies in ׀four continents. (2016) Lancet 388(10046): 776 –786. 5. Ford, E.S., Giles, W.H., Dietz, W.H. Prevalence of the metabolic syndrome among US adults: findings from the Third National Health and Nutrition Examination Survey. (2002) JAMA 287(3): 356-359. 6. Ponce-Garcia, I., Simarro-Rueda, M., Carbayo-Herencia, J.A., et al. Prognostic Value of Obesity on Both Overall Mortality and Cardiovascular Disease in the General Population. (2015) PLoS One 10(5): e0127369. 7. Aranceta-Bartrina, J., Pérez-Rodrigo, C., Alberdi-Aresti, G., et al. Prevalence of General Obesity and Abdominal Obesity in the Spanish Adult Population (Aged 25–64 Years) 2014–2015: The ENPE Study. (2016) Rev Esp Cardiol 69(6): 579-587. 9. Cameron, A.J., Magliano, D.J., Shaw, J.E., et al. The influence of hip circumference on the relationship between abdominal obesity and mortality. (2012) Int J Epidemiol 41(2): 484–494. 10. Whitlock, G., Lewington, S., Sherliker, P., et al. Bodymass index and cause-specific mortality in 900 000 adults: collaborative analyses of 57 prospective studies. (2009) Lancet 373(9669): 1083–1096. 11. Grimble, R.F. The true cost of in-patient obesity: impact of obesity on inflammatory stress and morbidity. (2010) Proc Nutr Soc 69(4): 511–517. 12. Berber, A., Gómez-Santos, R., Fanghanel, G., et al. Anthropometric indexes in the prediction of type 2 diabetes mellitus, hypertension and dyslipidaemia in a Mexican population. (2001) Int J Obes Relat Metab Disord 25(12): 1794-1799. 13. Bentley, T.G., Palta, M., Paulsen, A.J., et al. Race and gender associations between obesity and nine health-related quality-of life measures. (2011) Qual Life Res 20(5): 665–674. 14. Perez, M., Warren, C.S. The relationship between quality of life, bingeeating disorder, and obesity status in an ethnically diverse sample. (2012) Obesity 20(4): 879–885. 15. Moriarty, J.P., Branda, M.E., Olsen, K.D., et al. The effects of incremental costs of smoking and obesity on health care costs among adults: a 7-year longitudinal study. (2012) J Occup Environ Med 54(3): 286–291. 16. Cawley, J., Meyerhoefer, C. The medical care costs of obesity: an instrumental variables approach. (2012) J Health Econ 31: 219–230. 17. Pi-Sunyer, X. The Medical Risks of Obesity. (2009) Post grad Med 121(6): 21–33. 18. Forouzanfar, M.H., Alexander, L., Anderson, H.R., et al. Global, regional, and national comparative risk assessment of 79 behavioral, environmental and occupational, and metabolic risks or clusters of risks in 188 countries, 1990-2013: a systematic analysis for the Global Burden of Disease Study 2013. (2015) Lancet 386: 2287-2323. 19. The Global Burden of Diseases, Injuries, and Risk Factors Study (GBD) 2015. Institute for Health Metrics and Evaluation. 20. Rokholm, B., Baker, J.L., Sorensen, T.I. The levelling off of the obesity epidemic since the year 1999-a review of evidence and perspectives. (2010) Obes Rev 11(12): 835-846. 21. Lahti-Koski, M., Harald, K., Saarni, S.E., et al. Changes in body mass index and measures of abdominal obesity in Finnish adults between 1992 and 2007, the National FINRISK Study. (2012) Clin Obes 2(1-2): 57-63. 22. Global action plan for the prevention and control of non communicable diseases 2013-2020. WHO (2013). 23. Buckland, G., Bach, A., Serra-Majem, L. Obesity and the Mediterranean diet: A systematic review of observational and intervention studies. (2008) Obes Rev 9 (6): 582-593. 24. Giugliano, D., Esposito, K. Mediterranean diet and metabolic diseases. (2008) Curr Opin Lipidol 19(1): 63-68. 25. Schröder, H. Protective mechanisms of the Mediterranean diet in obesity and type 2 diabetes. (2007) J Nutr Biochem 18(3): 149- 160. 26. Mendez, M.A., Popkin, B.M., Jakszyn, P., et al. Adherence to a Mediterranean diet is associated with reduced 3-year incidence of obesity. (2006) J Nutr 136 (11): 2934-2938. 27. Toobert, D.J., Glasgow, R.E., Strycker, L.A., et al. Long-term effects of the Mediterranean lifestyle program: a randomized clinical trial for postmenopausal women with type 2 diabetes. (2007) Int J Behav Nutr Phys Act 4: 1. 28. Goulet, J., Lapointe, A., Lamarche, B., et al. Effect of a nutritional intervention promoting the Mediterranean food pattern on anthropometric profile in healthy women from the Québec city metropolitan area. (2007) Eur J Clin Nutr 61 (11): 1293-1300. 29. Estudio ALADINO 2015: Estudio de Vigilancia del Crecimiento, Alimentación, Actividad Física, Desarrollo Infantil y Obesidad en Espa-a 2015. Agencia Espa-ola de Consumo, Seguridad Alimentaria y Nutrición. (2016) Ministerio de Sanidad, Servicios Sociales e Igualdad. Madrid. 30. 30. CIHEAM/FAO. Mediterranean food consumption patterns: diet, environment, society, economy and health. A White Paper Priority 5 of Feeding Knowledge Programme, Expo Milan 2015. (2015) CIHEAM-IAMB, Bari/FAO, Rome. 31. Varela-Moreiras, G., Ruiz, E., Valero., T., et al. The Spanish diet: an update. (2013) Nutr Hosp 28(Supl. 5): 13-20. 32. Serra-Majem, L., MacLean, D., Ribas, L., et al. 2003 Comparative analysis of nutrition data from national, household, and individual levels: results from a WHO-CINDI collaborative project in Canada, Finland, Poland, and Spain. J Epidemiol Community Health 57(1): 74–80. 33. Garaulet, M., Pérez de Heredia, F. Behavioural therapy in the treatment of obesity (II): role of the Mediterranean diet. (2010) Nutr Hosp 25(1): 9-17. 34. Buckland, G., Bach, A., Serra-Majem, L. Obesity and the Medi- terranean diet: a systematic review of observational and in- tervention studies. (2008) Obes Rev 9(6): 582-593. 35. Perez-Martinez, P., Garcia-Rios, A., Delgado-Lista, J., et al. Mediterranean Diet rich in olive oil and Obesity, Metabolic Syndrome and Diabetes Mellitus. (2011) Curr Pharm Des 17(8): 769-777. 36. Beunza, J.J., Toledo, E., Hu, F.B., et al. Adherence to the Mediterranean diet, long-term weight change, and incident overweight or obesity: the Seguimiento Universidad de Navarra (SUN) cohort. Am J Clin Nutr 92(6): 1484-1493. 37. Christian, J.G., Tsai, A.G., Bessesen, D.H. Interpreting weight losses from lifestyle modification trials: using categorical data. (2010) Int J Obes 34(1): 207–209. 38. Rossner, S. Defining success in obesity management. (1997) Int J Obes Relat Metab Disord 21(Suppl 1): S2–S4. 39. Jensen, M.D., Ryan, D.H., Apovian, C.M., et al. 2013 AHA/ACC/TOS guideline for the management of overweight and obesity in adults: a report of the American College of Cardiology/American Heart Association Task Force on Practice Guidelines and The Obesity Society. (2014) Circulation 129(25 Suppl 2): S102–S138. 40. Wadden, T.A, Stunkard, A.J. Behavioral weight control. (2002) Handbook of Obesity Treatment. The Guildford Press 301–316. 41. Kirk, S.F., Penney, T.L. The Role of Health Systems in Obesity Management and Prevention: Problems and Paradigm Shifts. (2013) Curr Obes Rep 2: 315–319. 42. Matheson, G.O., Klügl, M., Engebretsen, L., et al. Prevention and management of non-communicable disease: The IOC consensus statement, Lausanne 2013. (2013) Br J Sports Med 47(16): 1003–1011. 43. Eysenbach, G. What is e-health? (2001) J Med Internet Res 3(2): e20. 44. Riley, W., Augustson, E.M. Mobile phone-based smoking cessation interventions increase long-term quit rates compared with control programmes, but effects of the interventions are heterogeneous. (2013) Evid Based Nurs 16(4): 108–109. 45. Wieland, L.S., Falzon, L., Sciamanna, C.N., et al. Interactive computer-based interventions for weight loss or weight maintenance in overweight or obese people. (2012) Cochrane Database Syst Rev 8: CD007675.